I really enjoy dipping veggies and meat in green goddess dressing. I had actually never heard of it until I visited a restaurant called The Melting Pot. If you've never heard of The Melting Pot, it's a fondue style restaurant and it is AH-MAZING! The main course came with an assortment of sauces. Among those sauces was a liquid gold called green goddess. So yummy! A short time ago, I was watching Food Network. I am addicted to Food Network. I have learned so much from watching the programs. A gal named Kelsey Nixon shared her recipe for green goddess dressing, and I quickly wrote down her instructions. As is typical of me, I altered it to fit my own personal taste. (Something I learned watching Food Network!) 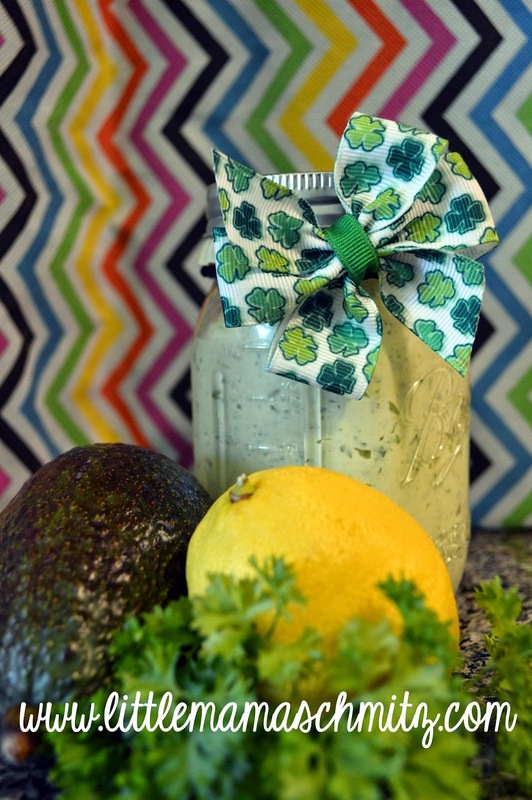 So here is my take on Kelsey Nixon's Green Goddess Dressing. There is really only one step; place ingredients in a food processor and chop it all together. There is just a tiny bit of work to prep the ingredients. *Make sure the avocado is RIPE! It will be slightly soft and starting to turn brownish/blackish. *When zesting the lemon, only take off the yellow. The white part, the pith, is bitter and unpleasant. Take care when juicing so that you do not get any seeds in your dressing. If you LOVE a strong lemon flavor, go ahead and use the whole thing. I found that a whole lemon was just too strong.